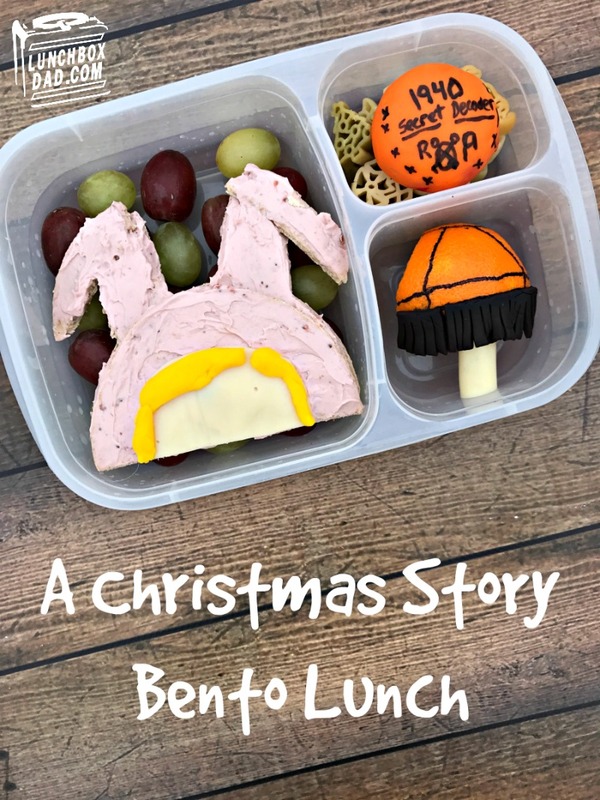 For my last special lunch before Christmas break, I had to give my kids A Christmas Story lunch! This is our favorite Christmas movie and we watched it as a family last Sunday night. It is seriously a classic and I don't think that there is any Christmas movie that surpasses it. Here is my Christmas geek confession. I even have a lighted Christmas village that is all scenes from this movie. It is my favorite decoration to put out every year. 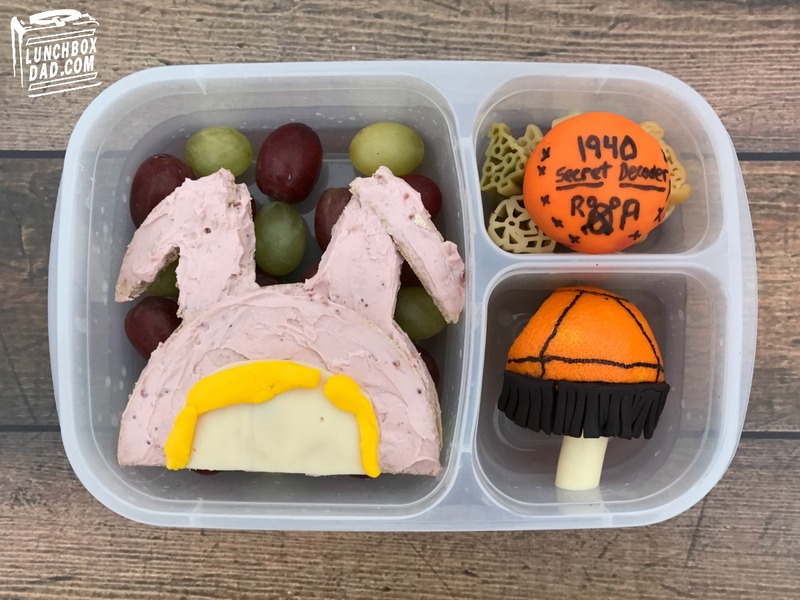 All that to say, I had a ton of fun putting this lunch together. I created the lunch in an Easy Lunch Boxes container. Of course I had to include the pink nightmare bunny suit, leg lamp, and secret decoder pin. Read below to find out how to make it! 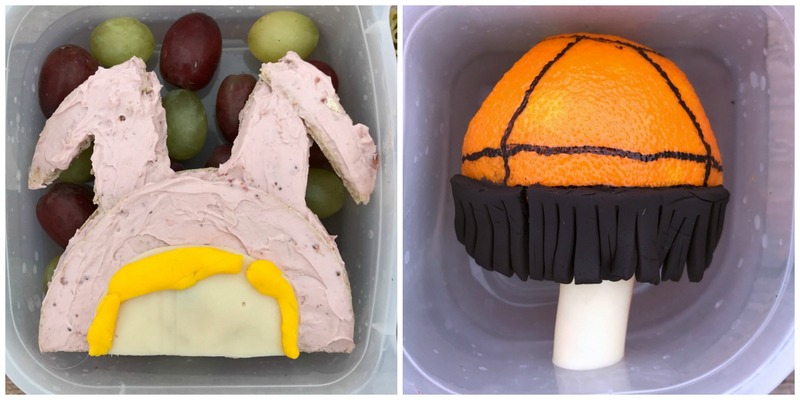 Ingredients: Whole wheat bread, strawberry cream cheese, sliced provolone cheese, read and green grapes, Babybel cheese, cooked Christmas themed pasta, mandarin orange, string cheese, black, orange, and yellow Wilton's Shape N Amaze edible decorating dough. 1. Cut a half circle and ears from whole wheat bread slices. Spread strawberry cream cheese on top to make the Pink Nightmare bunny suit. Also cut a half circle from provolone cheese. Mold yellow edible decorating dough into a few pieces of hair. Assemble as shown. 2. Drop red and green grapes into main compartment of lunchbox. Place pink bunny sandwich on top. 3. Use marker on Babybel cheese to create Little Orphan Annie Secret Decoder Pin. I covered it in orange edible decorating dough to give it a copper feel, but drawing on the red wax works as well. Place cooked pasta in side compartment and put secret decoder on top. 4. Cut mandarin orange into a lampshade shape as shown. Draw lines on peel using a marker. Create a black fringe using edible decorating dough and place on top. Use a small bit of water to make it stick to the orange. Slice the end off of string cheese and use a toothpick to stick it to the bottom of the orange. Place in second side compartment.